Leaders and HR management must ensure that conflict is appropriately managed within the workplace. By taking this responsibility, they are helping employees develop the capability to address their conflict situations on their own whenever possible. One means for doing this is one-on-one coaching to help employees work through conflicts and develop skills and strategies for addressing issues. develop strategies and approaches for managing the conflict when returning to the workplace. While the leader could always step in to address the conflict situation, or call upon a third-party such as human resources to assist, the point of providing direct coaching is to place responsibility and capability in the hands of the individual who is in the best position to address the situation in a manner that best meets their needs. For example, does the employee tend to avoid conflict altogether, seek to accommodate the other party even to her detriment, engage in competitive or aggressive behaviors, or work toward compromise or collaborative outcomes? Armed with your HR management and tools such as the Thomas-Kilmann mode, you will be prepared to proceed through conflicts. Some people like to play the devil’s advocate, challenging other people’s ideas for the sport of it. If confrontation makes your employee uncomfortable, explore the reasons with them during your employee coaching. Then, try increasing their comfort level when two people express different ideas. Recognize that, if handled correctly, disagreements can bring progress and innovation to an organization. Conflict resolution involves setting some rules. While many companies have codes of conduct built into their corporate policy and/or culture, others do not. You may need to create a set of guidelines for your own team if you overhear unkind remarks or witness any hint of workplace bullying. For example, creating a list of team communication standards that can be discussed during your management training can be very helpful. According to Joy Michael Associates, “ phrases like “Be respectful and honest,” “Use ‘I’ statements,” “Be direct and succinct,” and “Be present — no sidebar conversations,” have proven to be helpful for their team. When people are stressed, overtired or anxious, their coping skills are often compromised. If your company is going through a transition, such as a buyout or merger, a slowdown resulting in cutbacks or layoffs, or even a physical move , it can take a toll on individual and team morale. When leaders seek executive coaching services during trying times, take additional steps to manage the mood of the office so that everyone is better able to moderate the team atmosphere. If you notice tensions running high, encourage team members to take a break. A 15-minute breather in the cafeteria or a brisk walk around the block can do wonders to help calm a riled-up employee. During employee coaching, you can also promote a positive workplace environment by participating in a novel, team-building activity or through cultivating group traditions. For example, celebrating team sales goals and other victories with a group lunch outside of the office can foster increased transparency and a deeper sense of connectedness among team members. When people learn to appreciate and respect each other as individuals, their interactions back at the office take on a much richer quality. Being proactive as a coach can significantly boost morale and help you deflect conflict. In addition to being proactive, there must be a balance of neutrality. It might be tempting to take sides in a conflict between team members, but as a leader, you really can’t. Make sure you are giving team members equal time and opportunity to voice their opinions and feel heard. Notice if certain situations or responses push your own buttons, and try to keep personal biases out of the equation. 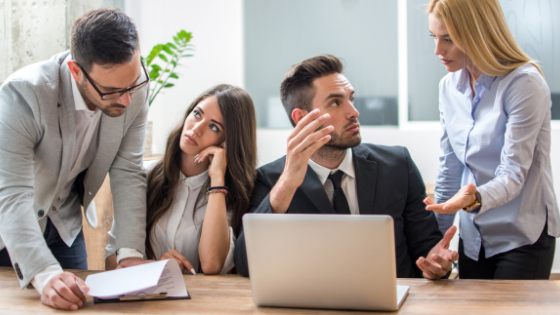 Although coaching colleagues through conflict has a number of benefits, as you just read, the point of conflict resolution management is to guide the team to work on their own. The benefits of one-on one coaching can help provide the office with the confidence and skill set to work peacefully with another and boost overall team morale in the workplace. Have you coached anyone through a conflict? What tips resonated with you and what tips would you add?